This often-set text was published in Blake's Songs of Experience (1789), with multiple instances of the engraving in color to be seen in exhibits and museums. The child with shuttlecock plays while an adult tends to another toddling child, as a visual decoration for this poem. For other settings of Blake's poems, click here. 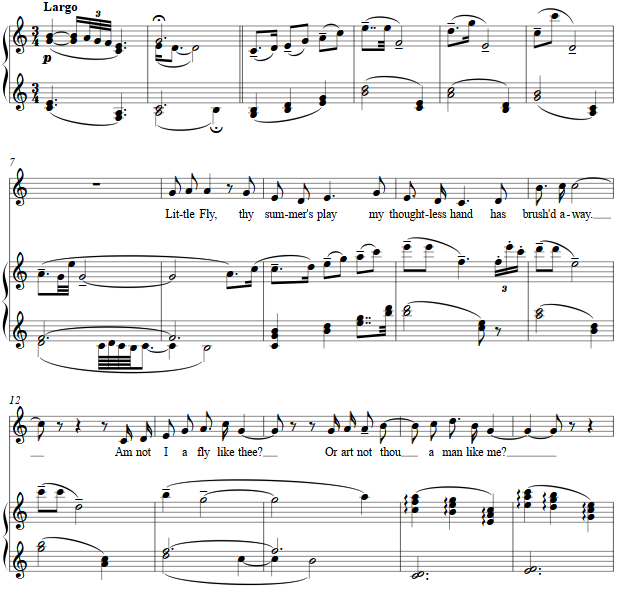 The setting is set as a vocal line adherent to the grammar and syntax, with an accompaniment written for the upper half of the piano (or other similar instrument) of crossing lines scales and wide leaps. Rubato as felt is suggested. William Blake (1757-1827) was poet, artist, mystic, engraver and publisher. His simple statement in rhyme and pictorial art stands in historical contrast to such later complex philosophies, also involving the fly. To bottle things up, fly to see: I never met a philosophy .